When we speak about translation tools we normally thinks about Babylon, an excellent language translation tool that started being free and is now distributed as payware. goot tries to become the free alternative of that excellent translator, even though it lacks some of the functions that make Babylon so interesting, like the image and flash animation optical character recognition (OCR). 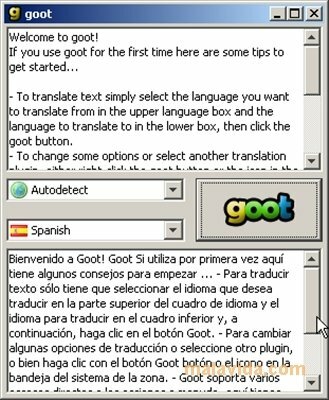 Despite this, goot is an excellent tool that will allow us to translate between many languages, making use of keyboard shortcuts and making use of different translation systems that will add languages, with the possibility to compare their results to adjust the translation to our needs. It works on a modular basis, making use of translation plug-ins that can be edited and created by anyone with Java knowledge. Per default it includes a Google translator plug-in that will allow us to translate single words or fool sentences with the translation engine developed by the famous search engine company. But in the developer's (AppJuice) forum we can find other plug-ins, like for example Babel Fish by Yahoo. A flexible and modular translator that tries to follow the steps of the renowned Babylon to become a free alternative.